Rana Daggubati Popularly Known as Rana,is an Indian Film Producer,Photographer and actor in both bollywood and tollywood. He was born on 14 December 1984 in Chennai, Tamil Nadu.He is the Nephew of Popular Actor Venkatesh and Grand Son of Famous Producer Dr.
Rama Naidu and cousin of Naga Chaitanya. He Made His Debut in 2010 with Leader Movie .For Leader Movie, He Bagged Filmfare Award for Best Male Debut – South,CineMAA Award for Best Male Debut. 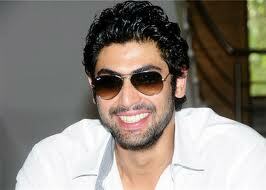 He made his Bollywood debut with the Hindi film Dum Maaro Dum(2011). Later He appeared in movies such as Nenu Naa Rakshasi(2011),Naa Ishtam(2012),Department in Bollywood, Krishnam Vande Jagadgurum(2012) he received SIIMA Award for Best Actor,Yeh Jawaani Hai Deewani(2013),Something Something(2013),Arrambam(2013)in tamil. His Upcoming Flicks are Rudrmadevi With Anushka and Baahubali Under SS Rajamouli Direction. Stay Tuned to Telugustop.com For More Updates about Rana Daggupati.